Part of the cover of a publication of the Roosevelt Wild Life Forest Experimental Station. See more images from the Adams Collection. Charles Christopher Adams was born in Clinton, Illinois on July 23, 1873 to William Henry Harrison Adams and Hannah Westfall (Conklin) Adams. Dr. Adams received his bachelor of science degree from Illinois Wesleyan University in 1895. He completed work for his master’s degree at Harvard University in 1899, his Ph.D. at the University of Chicago in 1908 and his Sc.D. at Illinois Wesleyan in 1920. Dr. Adams married Alice Luthera Norton in October 1908 and together they had one daughter, Harriet Dyer Adams. His wife died September 1, 1931. Throughout his lifetime, Dr. Adams won acclaim for his work in general animal ecology and the ecology of prairies, forests and lakes. He began his professional career as an assistant entomologist at Illinois State Laboratory of Natural History (1896-1898). In 1903, he was appointed curator of the University of Michigan Museum. He served there until 1906, when he became the director of the Cincinnati Society of Natural History. In 1908 he was appointed an associate professor at the University of Illinois. He became an assistant professor of forest zoology at the New York State College of Forestry in 1914 and was subsequently appointed to a full professorship in 1916. In 1919, Dr. Adams became the first director of the Roosevelt Wildlife Experimental Station in the Adirondacks. During his tenure, he was an instrumental force in the development of the Allegany State Park in Western New York. He left the Roosevelt Station in 1926 and assumed the directorship of the New York State Museum until his retirement in 1943. While serving as the director of the Museum, he began the development of its internationally acclaimed Shaker collection housed and worked to develop its art and history collections. Dr. Adams was a charter member of the American Association of Museums and a founding member of the American Ecological Society. In addition, he was a member of the American Society of Naturalists, the Association of American Geographers, the History Science Society and Sigma Xi. He is the author of Guide to the Study of Animal Ecology (1913). Charles Adams died on May 22, 1955 in Albany, New York and was buried in Burlington, Wisconsin. His two sisters, Katherine and Grace Adams, and his daughter, Harriet, survived him. The papers of Charles Christopher Adams contain correspondence, reports, and printed works detailing the development of the Roosevelt Wildlife Forest Experimental Station (Series 1: Boxes 1-9) and the Allegany State Park (Series 2: Boxes 10-13). 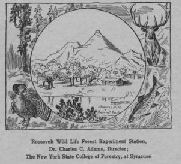 As a professor of forest zoology at the New York State College of Forestry, Dr. Adams’s interest in developing a forest preserve in the Adirondacks was realized with the help and support of a number of colleagues and, in particular, Theodore Roosevelt. The collection contains the chronological history of the Roosevelt Station, the original proposals for the station and related correspondence. In addition, while serving as director of the station, Dr. Adams was instrumental in initiating the Roosevelt Wildlife Bulletin. This publication was widely sought after and read by conservationist enthusiasts, as indicated by the volume of letters from people requesting copies. The Roosevelt Station papers continue beyond Dr. Adams tenure and include correspondence with Dr. Charles Johnson, Adams’s successor, and Dr. Ralph King, a subsequent director. In conjunction with his work at Roosevelt Station, Dr. Adams was also a driving force behind the development of the Allegany State Park and the Natural History School begun there. The collection contains the plans, reports, and correspondence pertaining to the park and the school as well as a number of photographs of the park, school, and students who attended. Of particular note is a collection of 11 photographs of Theodore Roosevelt taken in June 1915 on a trip to Louisiana and Mississippi. They show a carefree Mr. Roosevelt at his ease on an Audubon Society-related expedition. 1 8 "The State Wildlife Memorial to Roosevelt"
1 25 Blanchard, Frank N.
3 1 Kny Sherer Corp.
3 35 Southard, Charles Z. 8 3 News clipping: "Grouse Disease in Maine and Elsewhere in North America"
11 10 "Plans for Wildlife and Natural History in the Proposed Allegany State Park"
12 12 "Suggestions for the Management of Forest Wildlife in the Allegany State Park, New York"
12 15 "Allegany State Park and the City at Its Gate"
12 18 Advertisement - "The Natural History of Chautauqua"
13 Photographs of the Allegany School of Natural History facilities, students, fauna, animals, and surrounding area.